Greengauge 21 launches its high-speed rail strategy for Britain, developed through a work programme funded by its influential Public Interest Group. The report recommends a comprehensive network of routes linking all Britain’s major cities, which it believes to be vital for a competitive and sustainable Britain.On Wednesday 16th September, Greengauge 21 announces its high-speed rail strategy for Britain, developed through a work programme funded by its influential Public Interest Group. Greengauge 21 recommends a comprehensive network of routes linking all Britain’s major cities, which it believes to be vital for a competitive and sustainable Britain. It has found that 78% of people in Britain agree with the statement that ‘high-speed rail is essential for our future’. This is the first time a national network has been identified. Greengauge 21 says that it should provide a helpful context for the work of the Government’s company HS2, which is looking in the first instance at high-speed rail for the London–West Midlands corridor, and which is due to report to Ministers at the end of the year. Jim Steer, Director of Greengauge 21, explains that other countries such as Japan, France and Spain, having seen the success of their first high-speed line, each developed a long term national strategy to capitalise on the benefits available. Britain, which has its HS1 (the link from London to the Channel Tunnel), he says, must do the same. The cost of the full network is estimated to be £69bn and will be developed through a phased construction programme. Jim Steer summarises the business case simply: “for every £1 spent on the high-speed rail network in Britain, our economy gets £3.50 back”. “High-speed rail is an essential part of our national infrastructure and will be needed to accommodate the growth that will come with economic recovery. The benefits are very widely spread across Britain: 62% to the Midlands, the North and Scotland and 35% to London and the wider South East. This will help achieve a re-balancing of the pattern of economic growth”, said Jim Steer. 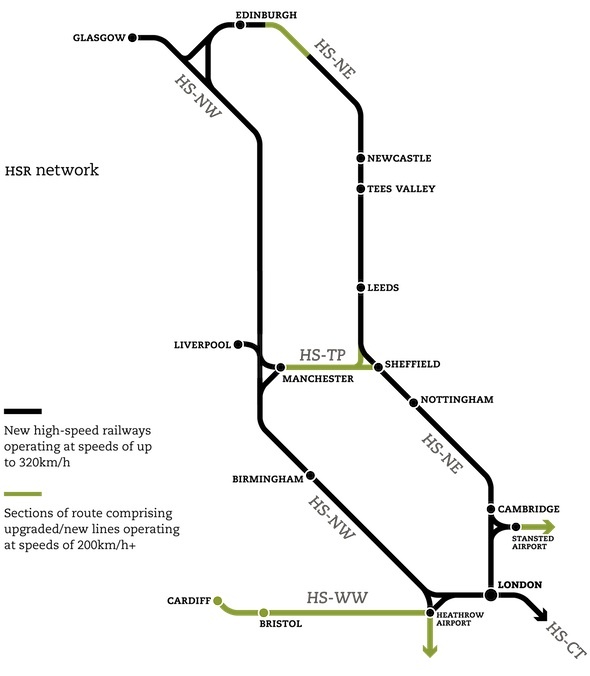 “The capacity boost from the national HSR network is two-fold, with 16,000 passengers/hour per direction on each new line, and a big release of capacity on existing main lines that (in turn) allows an expansion of local commuter services and freight”, Jim Steer added. “The new high- speed rail services will offer a much higher level of reliability and comfort and operate a full seven-day week. It is a chance to re-design customer service from scratch. The evidence is that high-speed rail will win passengers from car and air services, providing an alternative to congested motorways and crowded airports. This leads to a reduction in carbon from the transport sector of one million tonnes per annum”, Jim Steer said. “There are advantages from adopting a long term strategy so that we can start to plan around the benefits that HSR offers, with coordinated local and regional plans”, Jim Steer says, “and the Public Interest Group has started a new process of collaborative working that should be continued”. Jim Steer and Julie Mills from Greengauge 21, along with David Begg for the Northern Way, one of the member organisations of the Public Interest Group, will be launching the definitive report—Fast Forward: A High-Speed Rail Strategy for Britain—at the CBI at Centre Point, 1st Floor, at 2.30pm, 16th September.